The Bethlem Royal Hospital, once known as the ‘human zoo’ in a byname that wouldn’t look out of place as a Sun headline, was seen by the good people of the 18th Century as one of the most desirable shows of London. Now the inspiration for Nell Leyshon’s Bedlam, mad people are once again being viewed as a spectator sport, although The Globe is hoping through more enlightened eyes. More enlightened they may be, but there is still a sense of the gratuitous in Leyshon’s flat and irregular play. Madness comes and goes at a whim, characters flirt around each other like lovers in an under-baked Rom-Com and there is absolutely no sense of what it must have been like within the barriers and cells of this historical institution. Whilst entertaining enough to raise a smile, behind the fluff Bedlam is a hospital full of two dimensional clowns and bullies, tyrants, youths and lovers, and very little else. Dr Carew is the doctor who rules Bedlam with an iron fist. The arrival a beautiful country girl signals the beginning of the end for this villain as his grip is slowly weakened by the onset of madness and an abuse of alcohol. Meanwhile a sane girl is vindicated, a charlatan taught a sharp lesson and a beauty rescued by her lost love. Citing Hogarth’s The Rake’s Progress as her starting off point, Leyshon has failed to successfully show any of the meaty despair so tangible in the demented and debauched figures that populate these magnificent etchings. This Bedlam is more like a preening peacock, the postures and mannerisms are as cartoon-ish as Hogarth’s but here are worn like garments to be shown off and displayed; the peacock puffs out it’s chest out and we are supposed to be impressed. It is undoubtedly performed with energy by a spirited cast, particularly by the buxom Ella Smith, foppish Sam Crane and wholesome Phil Cheadlen. But with material that gives them nothing to get their teeth into it is hard for any of them to shine with great performers like Finty Williams and Kevork Malikyan being cruelly wasted. Bedlam is fairly jolly but never quite as fun as it thinks it is and it is only in the moments of choral singing that the tragedy and pain of madness is expressed or felt. Dr Carew’s descent into dementia makes no sense and the subplots are thin and easily forgotten. Is it farce or historical drama? Whilst it could have been both, Leyshon seems as confused as some of the afflicted in her play and so it ends up being neither. It is a gloriously humid early evening in May with crystal clear blue skies. Surely there could be no better back drop for The Globe’s opening night of Henry VIII, one of Shakespeare’s most sumptuous works. But for all this production’s beautiful framework (both natural and Angela Davies’ lustrous setting) this King does not, in literature at least, live up to the renown of his predecessors. 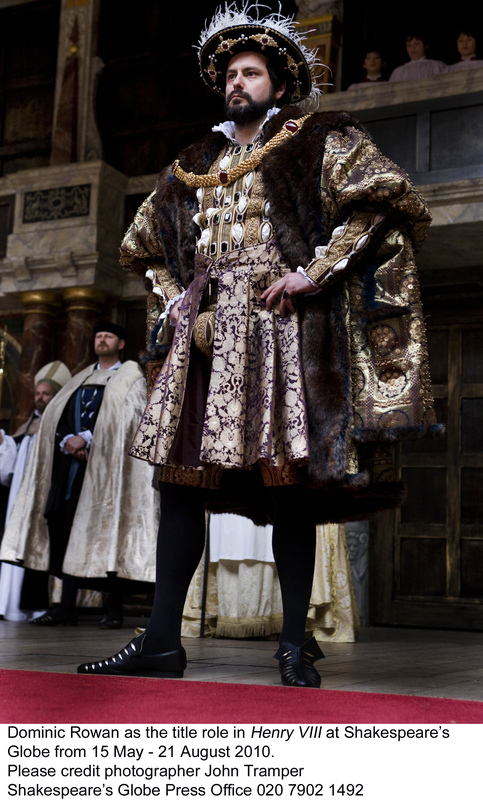 For whilst Henry VIII contains flashes of Shakespeare’s celebrated genius, for the most part it is too solidly set in the commonplace to be truly great. I’ve fallen in love and it’s with a long dead Elizabethan playwright. It’s easy to skim the surface with William Shakespeare and miss all the nourishment beneath. Rather capriciously if you’ve seen even one or two productions done very badly then it’s very easy to begin to think (somewhat treacherously) that maybe he’s not so ‘towering’ after all. But then you see one show which makes you realise why the British are so proud of this National Treasure and it’s like falling back in love with an old partner, suddenly all the annoying things that they do (the protracted verse, the ‘hilarious’ out of context social comedy) are transformed into actions and moments of delight. And so it was for me. Just as Rosalind falls so marvellously for Orlando in As You Like It, so I fell head over heels in love with Shakespeare after seeing a superlative production of this text which is currently on at the Globe. My interest had previously been moistened with a little light flirting in the form of Timothy Sheader’s very sweet Much Ado About Nothing at Regent’s Park Open Air Theatre, but it wasn’t until I sat in the Globe earlier this week that I was once again hopelessly enamoured with the Bard. Director Thea Sharrock and her superb cast have an immense understanding of As You Like It, and what can often seem like a string of famous quotes is woven together with great humanity and sparkling wit in an enrapturing production. 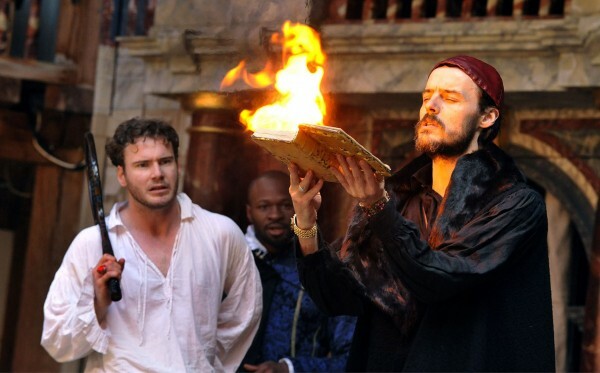 Out for all to see is Shakespeare’s inherent humour, the liveliness in his characters (in both villains and heroes) and his timeless empathy of the human condition all burnished with the richness of his beautiful language. Shakespeare then is daring, funny, lively, empathic, poetic, and elegant; it’s no wonder that I feel like a flushed school girl eager to see the next play from my long forgotten crush (I have already watched an outdoor promenade version of Romeo and Juliet, and still the flame burns for more). But I’m not a jealous lover and there’s plenty of Shakespeare to go around this season for everyone, if that is, you fancy it.